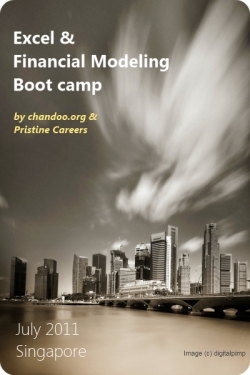 I am very happy to announce that I will be conducting an Excel & Financial Modeling boot-camp in Singapore this July[8th to 10th]. I am doing this boot-camp in collaboration with Pristine Careers. 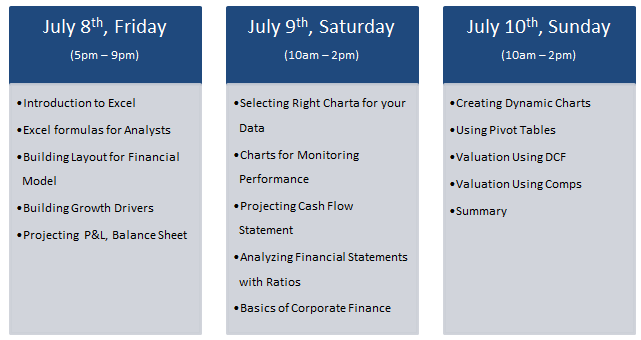 This boot-camp is aimed at business analysts, financial analysts & managers, who use Excel all the time. This boot-camp provides content on intermediate & advanced level Excel. So if you are an absolute newbie, you might find it difficult to follow the boot-camp. We will be conducting the sessions in SHRI, Singapore campus. The price of this boot-camp is SGD 300 per person. What should I do after making a payment? Please feel free to call me at +91 814 262 1090 or reply to this mail with your questions. I will be glad to help you out. We hope to see at the boot-camp.